In 2005 I attended a WebCT software conference in San Francisco California. The last night of the conference some friends and I had dinner at a restaurant on Fisherman’s Wharf. At this restaurant I enjoyed on of the best dishes I have ever eaten. The dish was kind of a seafood gumbo: there were huge shrimp, tasty crab, and oysters. Two slices of San Francisco’s famous sourdough bread accompanied the dish — which I used to soak up the wonderful sauce that the seafood sat in. The sauce really was the best part of the dish – it was very savory and salty. Man it was good! SAN FRANCISCO’s blue bay stirred in uneasy ripples. Little fishing boats cast purple shadows as they rocked themselves to sleep there by Fisherman’s Wharf. Gill netters, purse seiners, trollers, crab boats, day’s work done, were bedded down for the night. I sat in a corner of Tarantino’s Restaurant, its outer wall of clear glass, overlooking the harbor, looking into the West, all America at my back. There was Golden Gate Bridge, an arabesque in steel, delicate as spider’s webbing against the coming night. I could see lofty Mt. Tamalpais. “What’s this?” “Your bib, madam,” said the waiter, tying a cloth of white around my neck. In red stitched lettering the bib announced “I’m eating cioppino.” The words were scarcely digested when the stew arrived. The first fragrant fumes wreathed up to make friends with the nose. I poked into the dish with an exploring fork, a strange gathering of seafare–oysters, lobsters, crab, clams. Then the first rapturous taste of the sauce-steeped garlic bread–ummm, delectable sauce! This cioppino, pronounced “cho-PEEN-o,” is a bouillabaisse of sorts, a kissing cousin of the bouillabaisse (Col. 3–ed.) of Mediterranean cities, but this a California creation found nowhere else. Don Sweeney, Jr., and Gene McAteer, the Erin lads who operate Tarantino’s, told me the name is a corruption of the Italian word cuoco, which means “cook.” A fisherman’s concoction made first by the Genoese who man the small fishing boats which chug in and out of the harbor. The dish is made over charcoal braziers, made of whatever the day’s catch supplies. It may be shellfish entirely, or seafood and shellfish, the various kinds washed, cleaned, layered in the pot; then a rich garlicky tomato sauce added and the collection cooked. The fishermen usually leave the shellfish in the shells; restaurants and home cooks more often remove the meat. It’s all a matter of taste. VISIT San Francisco and eat cioppino or make it at home using the day’s market catch. Here we give you the recipe exactly as it’s made in the Tarantino kitchen. All but the romance; the sight of drying crab nets, the music of water lapping the gray timbers of the pier, the scent of night fog rolling in from the Pacific to enclose the city of hills in a gray wall. A green salad is just right with this meal-in-a-bowl. Allow at least a half-dozen paper napkins apiece. Those who live inland may not be able to get the full assortment of shellfish mentioned, but never mind, do as Western cooks do–add what you please. As to seafood, boned striped bass and halibut, cut in two-inch (Pg. 55, col. 2–ed.) pieces, are favorites for cioppino. Start the layering with the fish on the bottom, then tuck in the rest, any which way, but layered as to kind. Sauté garlic, onion, green pepper, leek and green onions in oil until golden. Add tomatoes, tomato puree, thyme and bay leaf. Cook slowly two to three hours, covered, stirring frequently. Add salt and pepper to taste; add wine; cook 10 minutes longer and pour over shellfish. Allow clams and oysters to stand in fresh water for one hour to remove sand. Split lobsters in half in shell. Split the crabs in half; disjoint the legs. Place in layers in a deep saucepan. Cover with sauce; simmer, covered, 15 minutes, adding water if necessary. 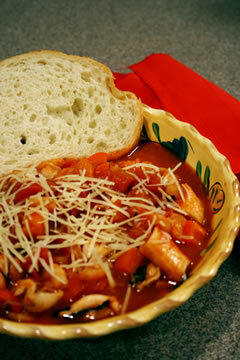 Heap into soup plates, garnish with garlic-toast fingers and serve from the kitchen. See that each bowl has some of each kind of fish and a big helping of the piping sauce. Yield: 4 portions. Many are the versions of this famous stew. Virtually anything goes if the sauce is good. R. A. Carey, a real-estate broker of San Anselmo, Cal., whose week-end (Col. 3–ed.) hobby is cooking for crowds, told us his way with the dish. He removes the fish from the shell, less messy eating. Do you have the Recipe from the old Doro’s Restaurant for Cannelloni? No, I don’t have that recipe. Is that one you are looking for, or one that you have and love?